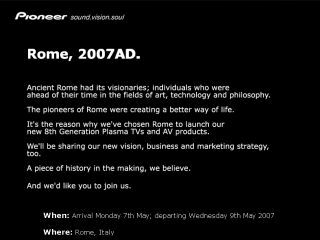 Plasma TV pioneers, erm, Pioneer , look set to drop their next-gen displays at a specially convened event that takes place between Monday 7th and Wednesday 9th of May. This will hopefully see the official European launch of the cool new plasma TVs they showcased at the Consumer Electronics Show ( CES ) in January. The company said at a press conference at CES that it was going back to first principles with plasma and had given the technology a stunning new lease of life - the demo we saw at the Las Vegas show was certainly proof of that. The company said in January that its new plasmas would debut in the summer, so the May launch announcement isn't a big surprise. However it looks like the company may have further shocks in store: the invite also says that it'll reveal "something quite remarkable." Tech.co.uk will be there to bring you the full story as it happens.